Catch up on this new single from 2Baba, MI Abaga, Teni, Chidinma, Waje, Umar M Shareef & Cobhams Asuquo – NOT FOR SALE out now! Top Nigerian music acts led by 2Baba and others like MI Abaga, Waje, Chidinma etc come together to make a song that passes the right message to voters. Like the name suggests votes are not for sale. 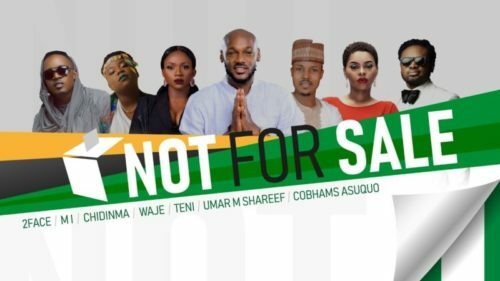 Watch 2Baba, MI Abaga, Teni, Chidinma, Waje, Umar M Shareef & Cobhams Asuquo – NOT FOR SALE below. Enjoy the music and share!